Who put all that sexism into Google’s Autocomplete? The most active phrase, “women should stay at home” is searched 720 times on average, world-wide, in all languages. All other phrases are searched much less often. 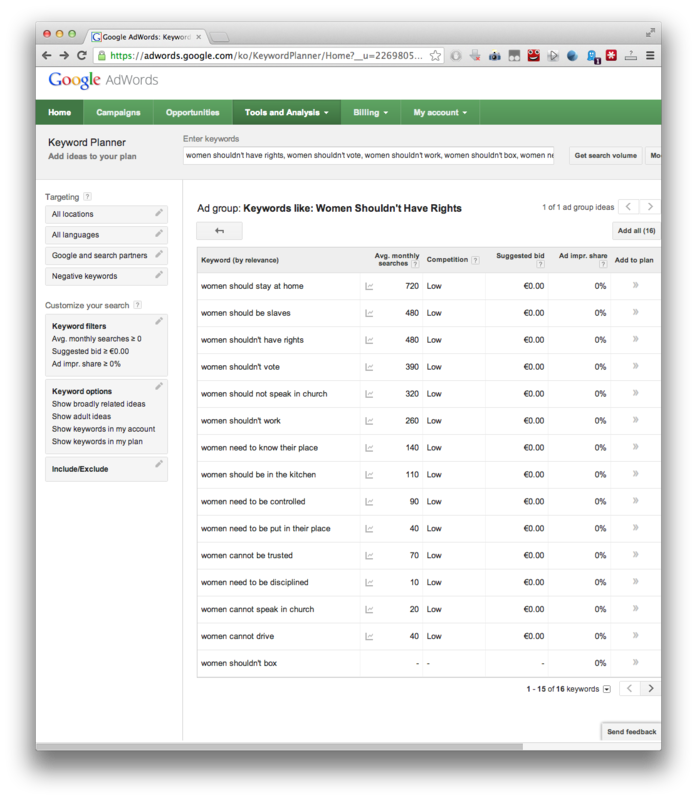 Additionally, we don’t even know if these 720 searches come from sexists, since we don’t know the motivation for the search. People could also search for the phrase out of curiosity or for research, as I did for my previous article. Searching for a phrase doesn’t mean to approve it. All phrases show a strong peak in search activity in March or April this year. Some of them, like “women need to be put in their place” or “women need to be disciplined“, even show no search activity before this time. So the question arises: Who searched so often for sexisms in the spring of this year – and why? 1 Thanks to Reinhardt for the hint to Google’s Keyword Planner. This entry was posted in English on October 25, 2013 by Georg. google suggest bases on search data and also on text correlations along documents found on the internet. it tries to suggest the most common of all phrases weighted by search volume and text relevancy. it does not mean, that one certain phrase is very common, but eventually there are no other combinations beginning with the certain phrase so common as the first suggestion.